are very happy to present to you a neat, tidy and professional publication that will meet all your informational needs on the latest developments and updates on the growing LPG markets in Africa. The publication will also be the window for the African LPG industry to connect to the rest of the world and gain updates on the latest technological developments and best practice case studies from the rest of the world. We couldn’t be more excited to have made it to this point and we look forward to working closely with the industry to produce a publication of exceptional quality. As our first issue, please take the time to familiarize yourself with our layout and the spread of articles that we have gathered for you. This publication will feature contributions from thought leaders, technological introductions, as well as exclusive interviews that will give you insights into developments in the African LPG marketplace. As the marketplace in Africa deepens and grows, we feel that it is very important to cut through all the noise and present thoughtful insight into what is happening in Africa. 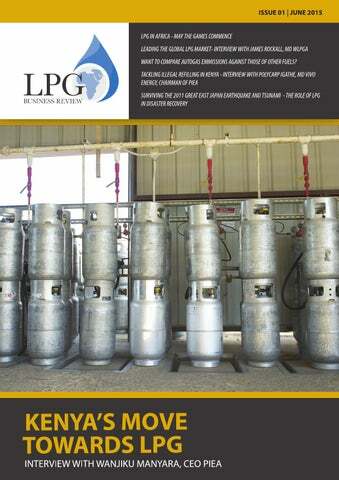 The LPG industry is niche and this publication will bring you knowledge from across the LPG value chain. This magazine is made with you in mind and we definitely need to know what you think. As the editor, I am constantly looking to improve the magazine and to hear your feedback, both positive and negative. Your feedback will be essential for us to build this publication for you. I would like to take this opportunity to thank all our contributors for making this a great first issue! If you feel that you would like to contribute articles, please feel free to contact me. I sincerely hope that you will enjoy what we have to present and I look forward to a long-lasting, fruitful relationship with all of our readers for years to come! Thank You! All rights reserved. No portion of this publication covered by the copyright herein may be reproduced in any form or means – graphic, electronic, mechanical, photocopying, recording, taping, etc – without the written consent of the publisher. Opinions expressed by contributors and advertisers are not necessarily those of the publisher and editor. Want To Compare Autogas Emissions Against Those of Other Fuels? benefits while engaging with the appliance manufacturing industry to ensure safe, modern and competitive appliances are developed that can run on LPG. In the developing world the critical barrier is often lack of a policy environment that it conducive to investment. The industry needs to work with governments, advising on policy and appropriate practices. destroys markets. This practice is not always illegal but the results are the same. The key is to educate government authorities about the need for investment in cylinders and the need for responsibility for cylinder maintenance to be clearly attributed to the cylinder owner and how, if this is done properly, markets can grow in a safe manner. What are your views on LPG safety? Safety of customers and employees is absolutely critical and needs to be an intrinsic part of all LPG operations. WLPGA produces many guidelines on safety in the business and these define not just the measures that should be taken and observed, but also where the responsibility for safety lies. In many cases lack of enforcement is impairing safety in the business, even where appropriate regulations are in place. What are your views on subsidies for LPG? Whilst I am in favour of making LPG more affordable, subsidies on the product itself can lead to many undesirable consequences such as a high subsidy burden for governments and subsidies being accessed by those that are not the intended target e.g. wealthy individuals or commercial operations. If the end-consumer cannot afford LPG at market price then one thing that can be considered is an energy grant that is transferred directly to the consumer to assist in the purchase of LPG. Such schemes are now in operation (e.g. in India) and enable far greater targeting of subsidies. years, it has been used as a data generator by industry experts IDtek across several major gas company installations. RFID is superior to other labelling methods because of its durability and capability to record numerous important details such as cylinder test dates, manufacture date, location, state and ownership. the tag. The same tags are then used to record cylinders being loaded onto pallets or cages. The pallets or cages are themselves tagged which creates a useful packing hierarchy especially when tagged vehicles are equipped with an RFID enabled OBC (OnBoard Computer). About IDtek Being the former solution design centre of the former RFID world-market leader Sokymat (today HID Global), IDtek became the dominating LPG cylinder tracking solutions provider after maturing its hardware and software platform over a 15 year period through its PEGASUS suite. IDtek is now perfectly aligned to substantially growth the market penetration of its cloud based LPG business suite, called PEGASUS QUICKstart utilising fast-deployment RFID and mobility techniques to generate and collect data. With installations across the globe, PEGASUS has become the premier product suite of choice for improvement of gas supply chain operations leading LPG innovation throughout the last decade. Rudolf is an entrepreneur and consultant active in the “gas based fuels and energy” industry. He is the founder of countless initiatives all with the aim to promote a gas based economy and affordable environmental protection. He is a professional business developer and negotiator who is involved in all aspects of the LNG and the LPG business. He is also very actively promoting green technologies that work well with gas based technologies. Rudolf has helped secure first Regasification capacity for his former employer EconGas at the GATE terminal in 2007 and holds a Masters degree in Commercial and Taxation law from the Jean Monnet faculty in Paris. He also runs a number of blogs, among them www.lng.guru and www.lng.jetzt. Nations Foundation) toxic fumes from open fires inside homes or household air pollution are responsible for more than 4.3 million deaths each year. Almost 600 thousand of these deaths occur in Africa. The WHO (World Health Organization) also reported that there are an estimated 265 thousand deaths every year caused by burns. INTERVIEW Regulatory Commission (ERC) and Industry through PIEA. A large container truck makes it way down a dirt path and pulls up at a marketplace in Ngonga. Plastered on the sides of this truck is the PIEA logo. It signifies that an LPG roadshow is about to begin. Like a transformer, the sides of the truck come up and the inside opens out into a stage. The curious crowd gathers, slowly surrounding the truck, listening to people on microphones speaking about the benefits of LPG. The air is filled with chatter and discussion. Samples of LPG cooking stoves, cylinders, heaters and even lamps are shown to the crowd and they are made to realize how their lives can be revolutionized with this brilliant blue flame. One of the PIEA objectives is the creation of public and consumer awareness on Environment, Health and Safety issues touching on handling and use of Petroleum products and the roadshow is one of the methods they use to do this. Wanjiku says that currently, the PIEA has embarked on an expansive LPG consumer education and sensitization campaign which kicked off in the fourth quarter of 2014. “The purpose of these campaigns, which include Road Shows in areas where illicit LPG trade is rife, are aimed at empowering consumers to make safe LPG purchase choices,” she adds. It was a Friday, 11 March 2011. At 2.46 pm, Tokyo time, a 9.0 magnitude earthquake stuck off the coast of Japan, setting off a terrible tsunami that devastated the entire northeast coast. transport people and even assist with transporting relief supplies to shelters as well. An example of how LPG provided a valuable lifeline in disaster recovery was evident very quickly when shelters were set up for the people displaced by the tsunami. In one instance, more than one hundred people who survived the tsunami crossed the snowy mountain to search for shelter. Cold, hungry and desperate, the survivors were greeted by a hot meal provided for by propane cylinders and cooking propane stoves that were available in a local parish office. Neighbours provided shelter and some semblance of order was quickly restored to care for the survivors. The parish office became a meal center fuelled by LPG and there was enough in storage to continue feeding the survivors for days because LPG distributors in the area brought kitchen kits including propane cylinders and propane cook stoves for meal centers into temporary shelters so that survivors could cook meals and warm themselves. Electricity supply was cut off in many areas and modern city life that depended on electricity suffered. For example, the service of the commuting trains was suspended. Stand-by generators fueled by propane were used to generate electricity at temporary shelters that were set up to house survivors to secure necessary lighting and communication while the electricity grid was disrupted. More than 52,000 units of the temporary housing for evacuees was built in northern Japan. They were equipped with propane facilities including heating units, cook stoves and hot water baths. More than 50,000 houses were rented for evacuees about 50% of which were propane fuelled. LPG’s role in saving lives in postcrisis Japan cannot be overstated. kitchen sets. Offices with bulk propane tanks could even be used as temporary shelters in the case of an emergency. People are also advised to stored/ use LPG in their residences, even during normal times. When disasters take place, land transportation is usually congested and it may become difficult to access shelters and accessible LPG tanks could provide a valuable lifeline. Disaster Prevention Arrangement among Japanese LPG industry and the government In order to facilitate the continuous supply of LPG in times of emergency, the government of Japan has facilitated a cooperation agreement between the members of the Japanese LPG industry. During an emergency, LPG importers could initiate discussions to borrow LPG from each other and take delivery of LPG at their agreed terminals. LPG inventory would be shared amongst all importers in this regard to ensure that enough LPG is available to cover emergency needs. Each local LPG Association located in the 47 Japanese administrative divisions including in the capital, Tokyo is part of the cooperation agreement with the local government where the association is located. When disaster strikes, they will cooperate with the local government by supplying propane cylinders and necessary equipment. with a safety relief device that will open and release the pressure before it gets too high. While this is compulsory in some countries, it is still not in many others. What is also painfully true is that these devices may malfunction or they may be obstructed by debris preventing them from operating properly. Type 4 composite LP-gas cylinders from Hexagon Ragasco, in case of overheating, will react differently. As the composite material carries insulating properties, the pressure inside the cylinder will not increase as rapidly, and the cylinder will remain intact. When temperatures start increasing, the material in the liner melts, and slowly releases the LP-gas through the cylinder wall, controlling the pressure inside the cylinder. Even if the pressure relief device fails, the cylinder will decrease the pressure until there is no more LP-gas left, and the cylinder can safely be removed. Hence there will be no BLEVE (Boiling Liquid Expanding Vapour Explosion) as otherwise often seen with steel cylinders involved in house fires. The safe behaviour of the T4 composite cylinders from Hexagon Ragasco in a fire enables the firemen to get close enough to extinguish the flames without any danger of a BLEVE. a proof test with water or air. The cost of this is marginal. When cylinder casings may be damaged they can easily be replaced with new ones, due to the ingenious click system by which they are assembled. In this way often only a part of the casing need be scrapped and not the whole cylinder or casing. CERTIFICATIONS Hexagon Ragasco cylinders are certified and approved in around 70 countries. World renowned third party inspection agency TÜV, Germany has tested the cylinders according to the ruling standards and issued the current type approval certificates. Hexagon Ragasco T4 composite cylinders comply with the international standards ISO 111193, EN 12245 and EN 14427, which state the requirements for fully wrapped composite cylinders. Furthermore the cylinders conform to the requirements of the DOT Special Permit 12706 and the TC Equivalency Certificate SU5931 as appropriate for the North American market. RECYCLING Environmental concern is very important when using advanced materials, and life cycle studies have been performed for composite LPG cylinders. roles at once, Polycarp says, “I start my day early; I’m usually in the office by 6am or at some meeting or the other. Extending my day in the morning is big lever in enabling me to juggle multiple roles.” Polycarp told us that he finds his passion for energy from being a Kenyan citizen. He strives to leave his mark on Kenya, ensuring that he leaves his country better than he found it. In this way he is paying his dues to his land and country. To him, energy is the driver of the economy and if he can make a difference here, it will be felt across all sectors and improve the lives of millions. We asked Polycarp, what his goals were with regards to LPG in Kenya? He told us that as far as goals go, he has two. The first being to restore the fidelity of the LPG market in Kenya by reducing illegal filling of gas to below 20% and to do this in partnership with the ERC (Energy Regulatory Commission) and other Government agencies directly involved such as KRA (Kenya Revenue Authority). The second being to expand LPG usage in Kenya by 10 times, from 100,000 tonnes a year of consumption to a million tonnes a year and to do this in partnership with the Government by switching domestic energy to LPG, away from firewood, charcoal & kerosene. He also hopes to lobby the Government (Ministry of Energy, Health etc) to ensure LPG is affordable to at least 40% of the population and to grow this number year on year, by subsidizing LPG or other means. “We lag way behind other African countries who are consuming in excess of 10 kg annually per capita. We must pull up our socks, compared to South Africa, Ghana, Algeria, Cote d’Ivoire, Tunisia, Morocco and Mauritius all have more encouraging LPG penetration numbers compared to Kenya,” he adds. is a publicly known fact that the lead terrorist in the Garissa University attack was operating an illegal LPG den in Eastleigh area of Nairobi. He cautions that one can be assured there are many more of such threats in illegal LPG filling. There is much work being done to combat illegal refilling.The ACA of which Polycarp is Board Chairman, has been conducting raids and have had the culprits arraigned in courts to face the law. He says that, “Education has also been done to LPG firms to register their trademarks and understand how to lodge complaint at ACA. Last week a big illegal LPG Den was shut down in a joint police ACA, KEBS (Kenya Bureau of Standards) and SGS Kenya Ltd operation in Nakuru.” He adds, “It is sad to note however, that the owners of this den had a fresh license issued by ERC.” He feels strongly that the regulator must up its enforcement game in respect of LPG. Online Registration is Open Take advantage of the Early Bird rates on the event website. Figure 1 : Ecopoint scores (ReCiPe method) for the seven brands available in 4-fuels3 C-Max was available in CNG in Euro 4 versions, but no longer in Euro 5 versions. Because of its history, we included it as a 4-fuel brand. We are working on growing and developing a more comprehensive LPG statistics database. If you have such data, let us know, we would love to get in touch with you. We can be reached at ryan@lpgbusinessreview.com. exporting LPG cargoes out of the US Gulf to the Far East appears to have become better in recent months since the grim era of trading at the beginning of the year in January. The chart below shows how this price spread has evolved since that time. This chart compares two points: •	The price spread. This, as shown, is the spread between the CFR Japan price and the traded Mont Belvieu price; •	and the trader cost structure which includes the terminal fee paid (we use here the contract terminal fee) and an estimate of the shipping cost. What are shown are representative trading economics. Individual trading economics will of course vary depending on timing, shipping cost and other factors. One factor to note. If we used freights based on the Baltic freight rate as a basis for shipping cost, we would find the arb window much more likely to be closed than open. However, most lifters out of the US Gulf on Far East route employ either their own vessels or vessels secured on time charter rates. The shipping costs shown above are based on a term time-charter rate of $1.4-1.6 million per month. •	Desired stock levels by Japanese importers after their inventory drawdowns for winter demand. •	The purchases by Chinese buyers for Petroleum Dehydrogentaion Plants (PDH) and other uses. PDH operations and margins (the spread between propylene and propane prices) had improved by that time. roughly to a $20/ton discount against what appears this week to have been an over-valued FEI. At these prices the arb for US May cargoes does not look so good. More US cargoes of course could stay in the Atlantic Basin. But in Europe propane stocks are high and propane is now selling at a $175/ton discount against naphtha. With propane prices below $400/ton, the arb economics from the US Gulf are not so great. No US Gulf cargoes are presently headed for NW Europe in June. Thus cargoes from the West will continue to come East. It is estimated that possibly 850,000 tons of LPG from the West will arrive in June. 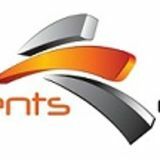 competitive place, with product from the US Gulf and East Coasts, Russia, and West Africa also looking for outlets. This leaves Asia. Here Algeria does have a freight advantage over alternative suppliers in the West such as West Africa and the US Gulf. This year, as Algerian LPG production has risen, there has been a step-up in Algerian LPG trade East. of last year. As long as the Asian/European price spread for propane remains in excess of $60/ton, we expect this trade to continue. The widening of Asian/European price spreads suggests that further movements may be possible. Lower demand for naphtha as Asia enters into the cracker maintenance season in Japan, Korea and Taiwan. More naphtha supplies from the Middle East, in particular from the new ADNOC refinery at Ruwais. Eventually, the refinery will increase an operating rate that has been running at 50% due to a new unit encountering start-up problems. ADNOC has started to offer two grades of naphtha from this refinery on the market. While the arbitrage volumes will be more available. Around 1.8 million tons of naphtha is expected to arrive in May and again in June from the West. If crude prices have peaked for the time being and naphtha crack spreads diminish then the cost of naphtha for Asian buyers will start to go down.